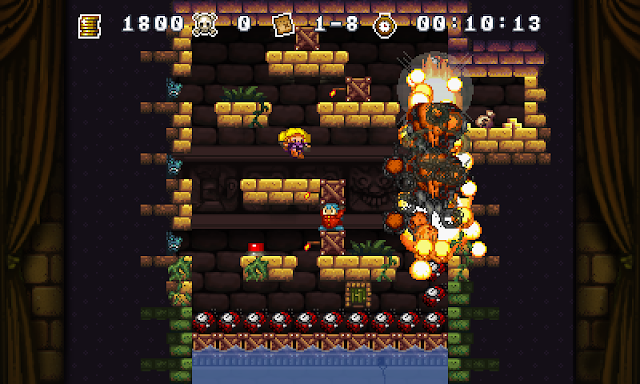 A new lightning pack from Indie Royale is making the rounds this week, but with a twist. This time, the folks at Indie Royale are putting out the long awaited Alpha Fund bundle, containing links to three in development titles and a promise of the full version upon release. Since the five million pound gorilla known as Minecraft hopped into the limelight with its alpha funding price structure, alpha funding has become an increasingly viable way to keep an indie game development team afloat during the rigours of development. As a developer you get an embedded fanbase who's all too willing to test your game for you, and lots of visibility with every new update; now with online stores like Desura and Gamersgate hosting dedicated Alpha sections of their stores it's even easier to distribute. As a gamer, you get the satisfaction of knowing you're funding a great original premise and a full game release to look forward too. It's pretty win-win. Of course, there are risks and such associated with alpha funding. Sometimes development stalls or falls through, leaving you with an unfinished product, or sometimes the team takes the games in a different direction you aren't happy with. Luckily for you, that's where I come in. Past the break are three short reviews for each of the included titles, which should help you decide if investing in the future of these games is something you want to do. From reading up on future plans for the game, Towns could very well be a thing of greatness. SMP bills it as a fusion of Dwarf Fortress, Dungeon Keeper and Diablo, but I would go so far as to add the Settlers series and Majesty to the list of influences. The idea of Towns is to build a town from scratch in the untamed wildness and on top of a dangerous dungeon. From that description, it sounds to me like a Tristram simulator, which seems like a really fantastic idea. Of course, Towns is currently in version 0.40 which is a long way off from the 1.0 realization of this premise, so how does the game hold up so far? 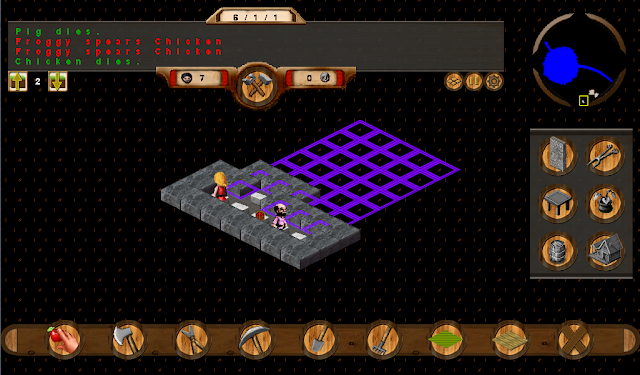 Unfortunately the dreamy Diablo/Dungeon Keeper aspects are still a ways away, but the rest of the game works very well as a Dwarf Fortress for beginners. The crafting features are already well fleshed out, with a pretty wide variety of tasks and tools for your poor townspeople to use. 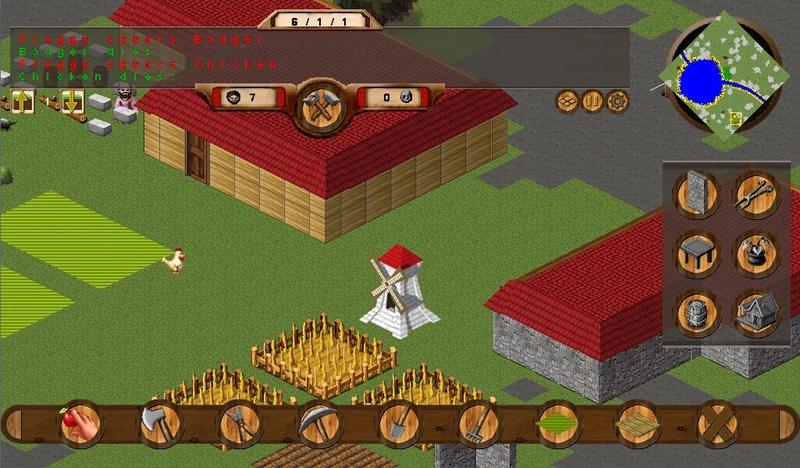 The big rush at the beginning of the game is to get a steady stream of food into your town, followed by proper crafting resources and then actually constructing your buildings. It's a very regulated progression of economy, with each new improvement you add allowing your people to harness increasingly rare resources and materials to make better improvements. It's not quite deep enough yet; it's not difficult to hit a metaphorical glass ceiling for your town in three hours or so, leaving little self imposed goals to achieve beyond bigger populations and better soldiers. However, it's very satisfying to get your town to a stable position, and from there you can expand across the map, or begin to dig in. Less fleshed out is the soldier system and combat. After your town finds itself in a stable position, the only real goal you have is to explore downwards into the depths. You can do this by building weapons and armour for your townies, and then converting them into soldiers. However, the Leeroy Jenkins AI exhibited by your unwise soldiers makes dungeon delving slightly tricky. You have absolutely no control over your town guards, and they will simply run and attack any enemy they can access no matter how injured they are, how strong it is or how angry it will make you. The game really needs some kind of off limits command, or the ability to specifically target certain enemies. Even regular chores have this issue too, due to the fact that you cannot assign specific villagers to certain tasks. Like Dwarf Fortress, it's all automated; you can command your townspeople to do something but it is up to them whether or not they follow up on your order right away. For example, instead of a dedicated mason, the walls end up being constructed by whoever is free if they don't get distracted by anything else. In my first game I watched my townspeople slowly starve to death because they felt like mining a new tunnel would be more fun then baking bread to sustain themselves. Then a horde of spiders gnawed off their starving faces. It may be too late for the citizens of Backlogville, but the next update is already slated to correct some of these problems. Towns 0.41 adds a priority list to emphasize what sort of tasks the townies should do first. It's a fairly elegant solution, which keeps the staple indirect control scheme, but makes it a bit easier to keep your townfolk happy and alive. There is the promise of much to look forward to in Towns, but I'm already pretty satisfied with what's been provided. Even more impressive is the variety of extra maps and mods being offered by the ever helpful community. With a few more tweaks, a better AI system for the soldiers, that much teased hero system and mod support, SMP could have a solid hit on their hands. 3079 is a game that proudly wears its influences on its sleeves. Introduced as a mix of Minecraft and Fallout, it would certainly look that way from the screenshots. However, as a game it tends to transcend both of those titles to a pretty unique shooter with a large RPG influence. The Fallout influence is pretty muted in my opinion; if anything, the game shares a lot more with the STALKER series, albeit with a setting more oriented to futuristic sci fi war narratives. You are a scout who has arrived on a distant planet that is home to two warring factions, each distinguished by their head position and number of legs. You begin allied to your fellow Humoids, but you can off your friends with a shotgun to the face and join the Neanders if you think two legs bad, four legs good. Between these two factions are the Demons, who are nigh invincible and extremely dangerous. By running through the ruined landscape to the various bases spread around the map, you can do missions and trade items with some of the local soldiers in order to build up your armoury and bank account. If the mercenary thing eventually grows old, there is a basic main quest built into the game revolving around ending the war and ridding the world of demons. It's nothing much yet, but trekking stealthy across a hostile ravaged landscape and going after a target is sublimely satisfying. There is a catch though. The game is going to tax your suspension of disbelief a lot. It's not a pretty game. There are no sweeping panoramas of landscapes. There are lighting issues. The three varieties of creatures you meet are primitive at best and nonsensical at worst, with basic polygonal models and textures. Why do some Humoids and Neanders grow to be four stories high? It's a biological mystery. 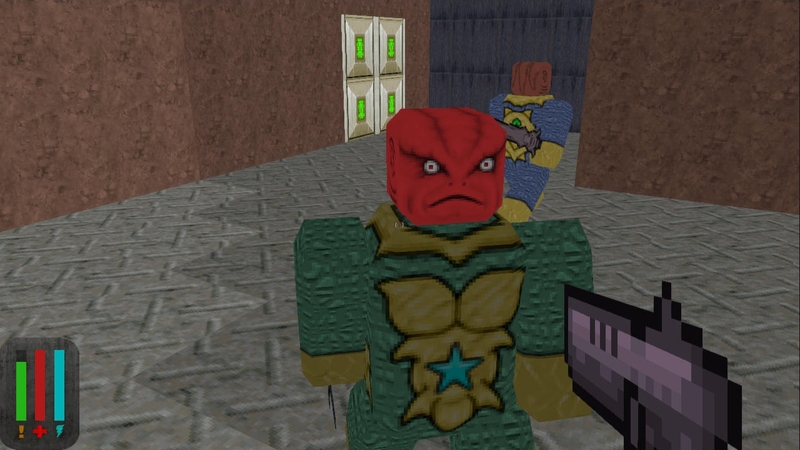 I mean, Minecraft had some pretty primitive graphics, without a doubt. But in 3079 it's less about primitive simple models and more about the dire need for an hired artist to clean things up. There are a few highlights I noticed, however. 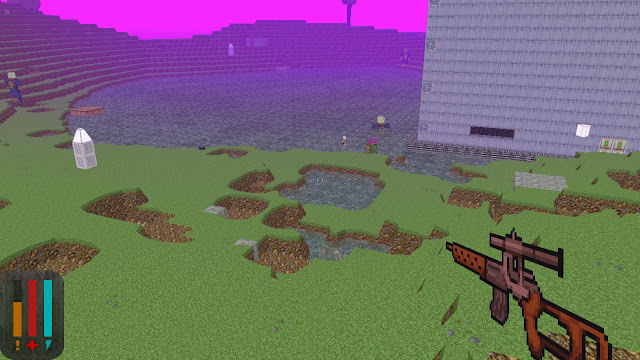 The ground actually looks pretty great; the decision to move away from the rigid cubes of Minecraft gives every hill and valley a unique flow, and the craters left behind by explosions and bullets look great. The main problems lie with the enemies, the lighting and the weapon models. However, I think it's a testament to how well the gameplay works that despite the primitive style it does manage to be an engaging, if not deep experience. I can't imagine I'd spend a particularly lengthy amount of time on the game, but I said the same thing about Minecraft and my hat was thoroughly eaten on that bet. There's a ways to go before 3079 will feel like cohesive whole, but the current build is an oddly engaging sandbox that's fun to mess around in. Right now the game just needs more depth, more polish and some quality of life tweaks. Wyv and Keep is the third game for this Royale, and it's also probably the lowest profile game in the package. However, it's definitely the most content complete game on the list, with a lot of polish and amusement already packed into the game. Wyv and Keep is a two player puzzle platformer much in the vein of the Lost Vikings games or perhaps a side scrolling Sokoban, but with a cool retro pixel graphic style, good writing and a great soundtrack (which is also a pack-in bonus with the Indie Royale). 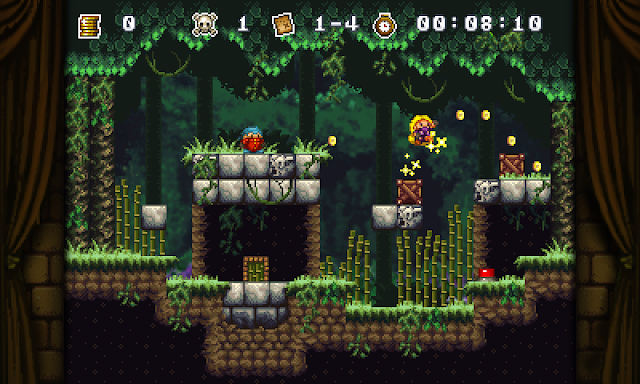 Wyv and Keep tells the story of Wyv and Keep, two treasure hunters on an expedition to a long lost temple, but like any good ancient video game temple, this one is filled with danger and box pushing puzzles. Using both characters, you need to shuffle around your crates to activate a floor switch, then reach the exit with either character to move on deeper to the mysterious Golden Idol. The puzzles start out very easy to work around, but as Wyv and Keep reach new chapters deeper in the temple, the puzzles start to get more and more challenging. Most of them rely on the fact that Wyv and Keep will actually collide with the boxes and each other, so you need to use your characters as gap fillers and platforms for extra height. As things go on, the game gets pretty good at throwing puzzles at you that need clever use of both players. I should probably clarify that the game is completely playable in single player; I've noticed a lot of confusion around the internet about that, but it works both ways. You can buddy up with a friend using the WASD keys to control Keep, and the arrow keys for Wyv, making for a very interesting co-op experience. If you're one of those forever alone types, pressing shift will swap the character you're controlling, allowing for single player co-op puzzle goodness. There are also medals to earn in each level revolving around time, amount of treasure and number of deaths. Luckily the game is lenient enough that it's perfectly possible to get these in single player as well. The best part about Wyv and Keep in my opinion is the dynamic between the two characters. They bicker and banter between levels, and also whenever they find one of the exploration journal pages that serve as the game's tutorials. The dialogue is a cut above the average writing quality in most indie puzzle games, with jokes and barbs that are actually pretty amusing and cute to read. Even the graphics serve to bring out the relationship dynamic; it's adorably heartbreaking to see one of the pair die, because the other bursts into tears before the level resets. Again, I feel like drawing a comparison to the Lost Vikings is appropriate because the style of dialogue and character relationships in both titles are very similar in style. It's amusing and beyond the expectations for a puzzle game. The alpha part of the game seems to come into play due to the stability. On my main computer, the game wouldn't run likely due to an outdated installation of one of the required dependencies. On an older laptop I borrowed it worked great, except for one crash as I exited the game. Overall it seems more or less bug free, but it seems there are just a few things left to work out before the game becomes a full release. However, I did want to thank a jolly corpse (@wyvandkeep on Twitter) and the lead programmer @uvTwitch for their very quick responses to my installation woes. Good support is always appreciated, so props to them. And that's it for my take on the Alpha Fund bundle. All three games are based on very promising premises and I'm eager to see how they evolve on their way to 1.0 status. 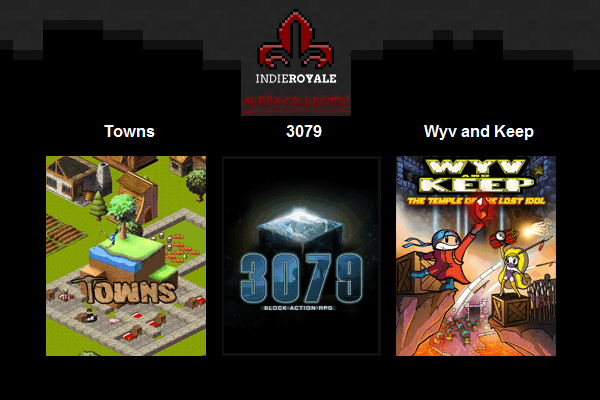 If you're curious about the games yourself, head on over to Indie Royale's page to pick these up for a steal. And be sure to check up on Backlog Journey over on Twitter for updates about the relaunch of Backlog Journey and another Royale giveaway for you or a friend.